Ultimately, the role of marketing in an architecture, engineering or construction (AEC) firm is a summation of activities designed to identify opportunities, attract clients, win projects, satisfy client needs and win more work. However, marketing in the AEC industry presents many unique challenges. Professionals in the industry may sell products, services, or a combination of the two. Selling products is vastly different from selling services as each requires distinct processes and skill set. In both cases, marketing can serve as an enabler of the sales process. The majority of people holding marketing or business development roles in the industry do not have formal marketing training, rather, most have a technical background. There are many benefits to technical staff members holding marketing/sales roles, specifically their ability to intimately understand what they are marketing and selling. However, without marketing expertise, their efforts may be haphazard or ineffective. One of the challenges marketers in this industry face is the lack of training related to marketing and sales specific to the AEC world. Most business programs, whether undergraduate or advanced, focus on business-to-consumer marketing. Or, even if they cover business-to-business, little time is spent on the unique aspects of marketing professional services. This is particularly true in the construction industry where the focus is on generating revenue based on projects. In addition, business-to-business implies that businesses buy from businesses. In reality, people in business buy from other people in business. Therefore, marketing must be designed to communicate with and influence people. Yet another challenge for marketing in the AEC industry is the multitude of decision-makers who must be addressed. For each opportunity, architects, engineers and owners need to be addressed, and each needs to be reached with different messages. In addition, each organization may have multiple decision makers and influencers. Identifying each person’s role in the process can be challenging. While many AEC firms regularly embark on a formal business planning process, marketing is often left out. Oftentimes, when marketing is excluded, firms fail to develop a marketing strategy and a formal marketing plan that outlines objectives, goals and strategies, tactics, and measurement. Marketing is a critical part of a firm’s success and should be integrated at all levels of the organization. Finally, due to the typical lack of understanding and formal training about marketing, there is often confusion about the difference between marketing and sales. While larger firms may have both a sales staff and marketing professionals, too often the roles are lumped together. While marketing and sales are both part of the business development function, it is important to understand the difference between the two. Marketing’s role is to help condition the environment for a sale by systematically identifying needs and wants, then develop and implement a plan to communicate potential solutions to satisfying that demand. Sales’ role is to focus on building and maintaining relations that lead to the sale of profitable opportunities. To be truly effective, marketing and sales professionals must work closely as part of a firm’s business development process. 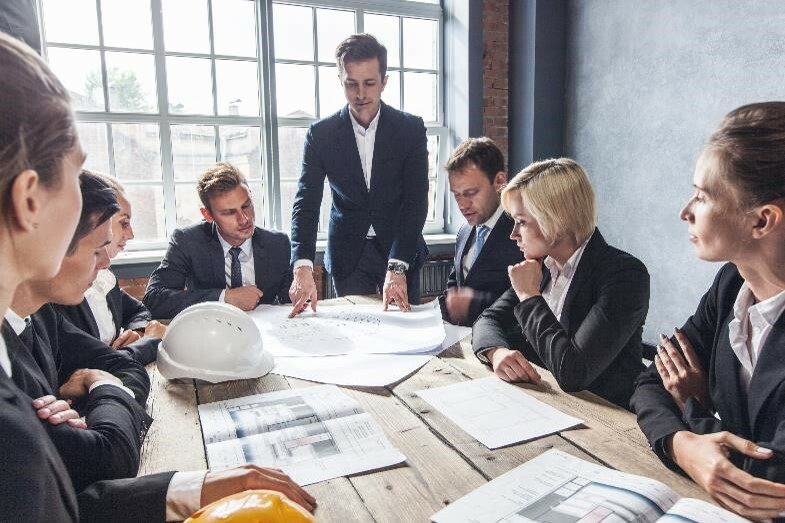 Despite these challenges, there is great opportunity for those currently in or seeking to embark on a sales or marketing career in the AEC industry. Even for firms that don’t have a dedicated marketing function, an orientation to marketing is essential. Technical professionals need to understand how their roles, actions, and client interactions leave an impression of the firm that has an impact on potential future work. Leading with Marketing provides a template for success.